Congratulations, and welcome to Stock Technical Analysis in Python! You have taken your first step towards making smarter, more disciplined trading decisions. Before diving in, let’s make sure you have everything you may need. We recommend downloading Anaconda 4.4.0, with Python 2.7. Anaconda comes pre-loaded with the three modules you will use throughout the course. StockCharts, Investopedia, and Google Finance are great resources for financial knowledge. You are now ready to dive in! Last Tutorial, we outlined steps for calculating the Mass Index. 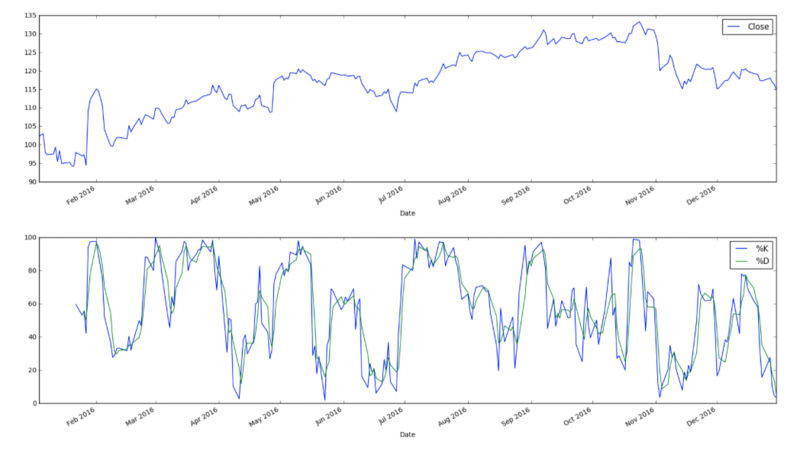 In this Tutorial, we introduce a new technical indicator, the Stochastic Oscillator. Developed by George C. Lane in the late 1950s, the Stochastic Oscillator is a momentum indicator that shows the location of the close relative to the high-low range over a set number of periods. 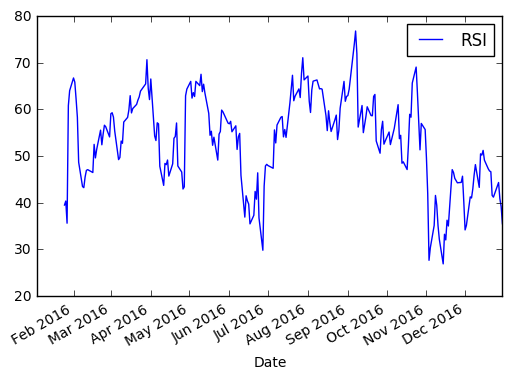 The default setting for the Stochastic Oscillator is 14 periods, which can be days, weeks, months or an intraday timeframe. A 14-period %K would use the most recent close, the highest high over the last 14 periods and the lowest low over the last 14 periods. %D is a 3-day simple moving average of %K. As a bound oscillator, the Stochastic Oscillator makes it easy to identify overbought and oversold levels. The oscillator ranges from zero to one hundred. No matter how fast a security advances or declines, the Stochastic Oscillator will always fluctuate within this range. Traditional settings use 80 as the overbought threshold and 20 as the oversold threshold. These levels can be adjusted to suit analytical needs and security characteristics. Readings above 80 for the 20-day Stochastic Oscillator would indicate that the underlying security was trading near the top of its 20-day high-low range. Readings below 20 occur when a security is trading at the low end of its high-low range. Before looking at some chart examples, it is important to note that overbought readings are not necessarily bearish. Securities can become overbought and remain overbought during a strong uptrend. Closing levels that are consistently near the top of the range indicate sustained buying pressure. In a similar vein, oversold readings are not necessarily bullish. Securities can also become oversold and remain oversold during a strong downtrend. Closing levels consistently near the bottom of the range indicate sustained selling pressure. It is, therefore, important to identify the bigger trend and trade in the direction of this trend. Look for occasional oversold readings in an uptrend and ignore frequent overbought readings. Similarly, look for occasional overbought readings in a strong downtrend and ignore frequent oversold readings. Let’s use Python to compute the Stochastic Oscillator. 2.a.) Define function for querying daily close. 2.b.) Define function for querying daily high. 2.c.) Define function for querying daily low. 3.) Define function for the Stochastic Oscillator, both %K and %D. How does the Stochastic Oscillator function work? 3.a.) To calculate %K, we find the difference between the current close and the lowest low for the look-back period, n. We then find the difference between the highest high for the look-back period, n, and the lowest low for the same look-back period. Dividing these two values and multiplying the result by 100, we arrive at %K, which we set to variable STOK. 3.c.) To calculate %D, we first calculate %K. 3.d.) Then we take the 3 day moving average of %K, and set the value to variable STOD. 4.) 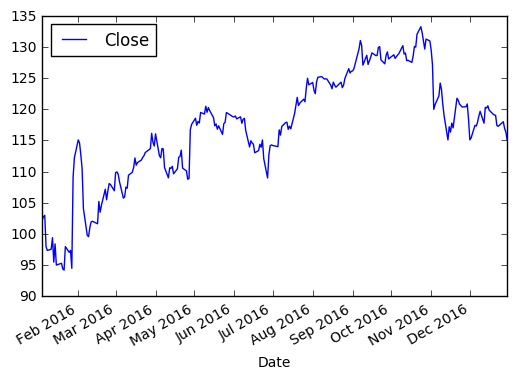 Query daily close, high, and low for ‘FB’ during 2016. 5.) Run daily close, low, and high through %K and %D functions. Save series to new columns in dataframe. 6.) Plot daily close, %K, and %D. Last Tutorial, we outlined steps for calculating Commodity Channel Index (CCI). In this Tutorial, we introduce a new technical indicator, the Mass Index. Developed by Donald Dorsey, the Mass Index uses the high-low range to identify trend reversals based on range expansions. In this sense, the Mass Index is a volatility indicator that does not have a directional bias. Instead, the Mass Index identifies range bulges that can foreshadow a reversal of the current trend. First, the Single EMA provides the average for the high-low range. Second, the Double EMA provides a second smoothing of this volatility measure. Using a ratio of these two exponential moving averages normalizes the data series. This ratio shows when the Single EMA becomes large relative to the Double EMA. The final step, a 25-period summation, acts like a moving average to further smooth the data series. Overall, the Mass Index rises as the high-low range widens and falls as the high-low range narrows. Donald Dorsey looked for “reversal bulges” to signal a trend reversal. According to Dorsey, a bulge occurs when the Mass Index moves above 27. This initial bulge does not complete the signal though. Dorsey waited for this bulge to reverse with a move back below 26.50. Once the reversal bulge is complete, traders should use other analysis techniques to determine the direction of the next move. Ideally, a downtrend followed by a reversal bulge would suggest a bullish trend reversal. Conversely, an uptrend followed by a reversal bulge would suggest a bearish trend reversal. 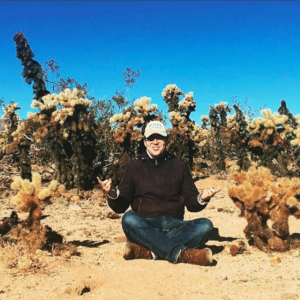 Let’s use Python to compute the Mass Index. 3.) Define function for Mass Index. How does the Mass Index function work? 3.a.) Function calculates the difference between the high and the low, and sets this value to variable Range. 3.b.) Function takes a 9 period Exponential Moving Average of the Range, and sets this value to variable EX1. 3.c.) Function takes a 9 period Exponential Moving Average of the EX1, to smooth volatility, and sets this value to variable EX2. 3.d.) Function takes the ratio of EX1 to EX2, and sets this value to variable Mass. 3.e.) Function calculates the 25 period rolling sum of Mass, and sets this value to variable MassIndex. 5.) Run daily high and low through Mass Index function. Save series to new column in dataframe. 6.) Plot daily close and Mass Index. Last Tutorial, we outlined steps for calculating Rate of Change (ROC). In this Tutorial, we introduce a new technical indicator, the Commodity Channel Index (CCI). Developed by Donald Lambert, the Commodity Channel Index (CCI) is a versatile indicator that can be used to identify a new trend or warn of extreme conditions. CCI measures the current price level relative to an average price level over a given period of time. CCI is relatively high when prices are far above their average. CCI is relatively low when prices are far below their average. In this manner, CCI can be used to identify overbought and oversold levels. Lambert set the Constant at .015 to ensure that approximately 70 to 80 percent of CCI values would fall between -100 and +100. This percentage also depends on the look-back period. A shorter CCI (10 periods) will be more volatile with a smaller percentage of values between +100 and -100. Conversely, a longer CCI (40 periods) will have a higher percentage of values between +100 and -100. As a leading indicator, chartists can look for overbought or oversold conditions that may foreshadow a mean reversion. Similarly, bullish and bearish divergences can be used to detect early momentum shifts and anticipate trend reversals. 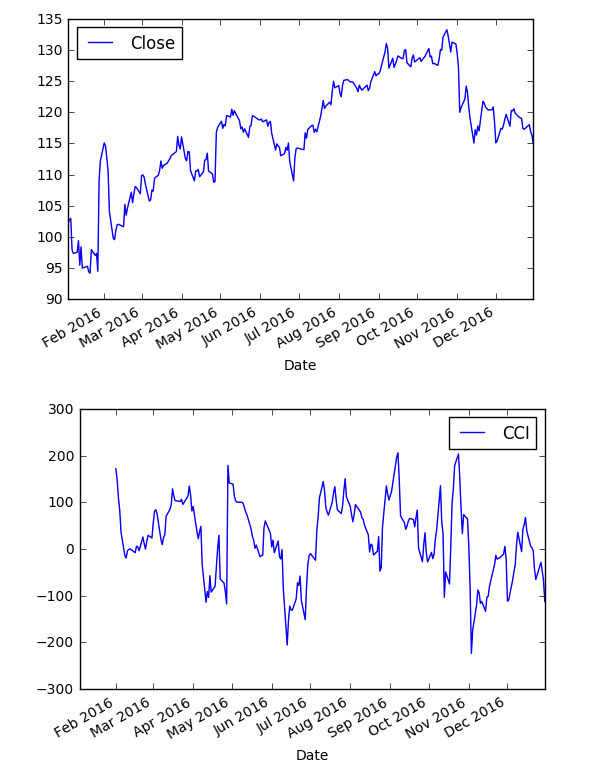 Let’s use Python to compute the Commodity Channel Index (CCI). 3.) Define function for Commodity Channel Index (CCI). How does the CCI function work? 3.a.) Function calculates Typical Price as the sum of the (High, Low, and Close) divided by three. The function sets this value to variable TP. 3.b.) Function subtracts n period simple moving average of the Typical Price from the current Typical Price. The difference is divided by the n period standard deviation of the Typical Price multiplied by the constant. The function sets this value to variable CCI. 5.) Run daily close, high, and low through CCI function. Save series to new column in dataframe. 6.) Plot daily close and CCI.